During the most recent Certified Online Traning Professional certification course, I was showing my screen and telling class attendees about a cool technique I use when I want to ensure learners can see my mouse pointer. In the animated gif image below, check out the circle that appears around my mouse. Pretty nifty, eh? 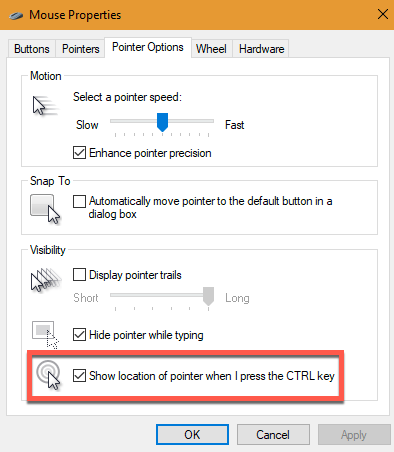 I am able to make my mouse pointer perform this little trick by simply pressing the [ctrl] key on my keyboard. Of course, this behavior isn't enabled in Windows by default. If you'd like to play along, bring up your computer's Control Panel > Change Mouse Settings (you can search mouse settings on your PC if you cannot find it right away). On the Mouse Properties dialog box, Pointer Options tab, select Show location of pointer when I press the CTRL key. Click the OK button and you're done.